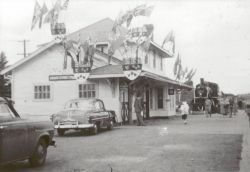 Over the past 120 years, Red Deer has had four distinct railway stations, three of which were unique to the community -- the 1910 CPR station, the 1912 ACR station (which was never actually used as a station) and the 1923 CNR station. Red Deer's first station was actually a boxcar put in place as soon as the Calgary & Edmonton Railway reached Red Deer in the fall of 1890. The boxcar was replaced the following year by a combination station and freight house that was characteristic of stations on rail lines built by McKenzie and Mann (two of the owners and builders of the Calgary & Edmonton Railway as well a few regional railways in Saskatchewan and Manitoba and later the founders of the Canadian Northern Railway). The station immediately became the distribution, cultural and communication centre of the fledgling community. The Calgary & Edmonton Railway arrived in Red Deer in the fall of 1890 and built a cookie-cutter combination station and freight house the following year. These stations were built approximately every twenty miles between Calgary and Edmonton and were constructed in about three weeks each. They started out virtually identical but over the next several years, modifications were made to each station to make them more functional according to the needs of the community and station master resulting in some distinction but the primary characteristics remained. After Red Deer officially became a division point in 1908, a new station was contemplated. When the new station opened in 1911, the combination station was relocated from north of the new station to south of it and turned 180 degrees. It was added to and used exclusively as a freight house until the early 1960s. It was demolished in 1965. Similar stations were built north of Red Deer at Lacombe, Ponoka, Wetaskiwin, Leduc and Strathcona. Except for Ponoka, all were replaced by larger stations by 1914. 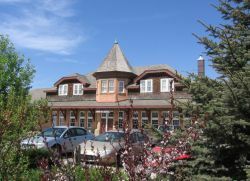 South of Red Deer, this design was built at Innisfail, Olds, Carstairs and Airdrie and most remained as the principal station until the 1950s. South of Calgary, similar stations were built at High River, Claresholm, Okotoks, Nanton, and De Winton. The Calgary & Edmonton Railway (owned partially by railway builders McKenzie and Mann as well as James Ross, a contractor with the CPR) leased the line to the CPR until the CPR purchased it outright. These and similar stations were built in Saskatchewan and Manitoba on railway lines built by railway developers McKenzie and Mann who eventually formed the Canadian Northern Railway which competed with the CPR. A replica of this type is located in South Edmonton (Strathcona) based on the Innisfail station although the freight shed portion was not replicated. These stations were primarily built on railway lines that were influenced by McKenzie and Mann prior to their founding of the Canadian Northern Railway. See C&ER combination station and freight house page for more detailed information including renderings of all 4 views of the station and interior layout. Note: All renderings are the intellectual property of Paul Pettypiece and may only be used for personal or historical use. 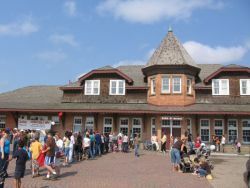 When the Canadian Pacific Railway determined that Red Deer would be the division point between Calgary and Edmonton, it was fitting that the company decided to build a new brick station in a style that was unique but similar to other major stations built in Western Canada (Lethbridge, Medicine Hat, Strathcona and Saskatoon) to replace the existing combination station and freight house built in 1891. These five stations all had a chateau style design with a central octagonal turret but each maintained a unique look. Photo shows both the new station and the old station on the north side prior to it being relocated to the south side and rotated to face the opposite direction. The new Red Deer station was completed in 1910 at the head of Ross Street dominating the downtown streetscape. Its characteristics included a hipped roof, dormer windows and, in Red Deer, the use of local bricks and sandstone. Dimensions were 112'x32' for the foundation, 126'x36' roofline, 14' waiting room ceiling, baggage room, express office, ticket office, washrooms on the main floor and train crew apartments on the upper floor. Within 18 months, a 20' expansion was added to the south end. At some point before 1941, a number of cosmetic changes occurred as part of its ongoing maintenance that included painting the shingled upper storey white, a change in roof colour, an additional door on the streetside, a new chimney on the south end and some changes in door and trim colour. In 1969, a major renovation occurred which brought about several internal and external changes that included a new heating system, main doors relocated to the bay section both front and back, freight doors downsized, new windows on the upper floor, cream trim, new roof and, on the trackside, the addition of an outside door to the upper floor and repositioning of doors on the lower floor. By the time passenger rail service ended in 1985, the station was starting to show its age. Furthermore, plans were underway to close the station and relocate the railyards to the west side of the city. That relocation occurred in 1990. Also, by this time, the bricks had been painted a number of times, the most recent a dark red. With relocation of the railyards, plans were also under way to connect Ross Street with Taylor Drive, initially involving the demolition of the station. Due to some fast and intensive work by a few individuals, the station was federally designated a protected historic site in 1991, mere days before its scheduled demolition resulting in new plans to route Ross Street around the station. A few months later it was designated a municipal historic site and in 1993, a provincial historic resource. It sat empty for a few years waiting for someone to propose a use for it. In 1996, it was purchased by architect John Murray and restored to much of its former glory on the outside and renovated to office space on the inside. This restoration included taking the paint off the bricks to reveal its original salmon colour. The railyards themselves were redeveloped into commercial and residential use and Taylor Drive was constructed along the CPR right of way south. See Red Deer 1910 CPR Station for more detailed information including renderings of all 4 views of the station and interior layout (coming soon). 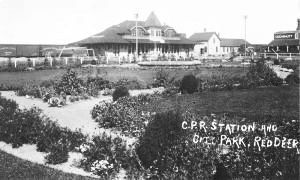 (ACR launched 1910) station built 1911 in new yard east of Piper Creek, never used as station; relocated twice as private residence; now west of Red Deer; effectively one-of-a-kind. In 1911, the Canadian Northern Western Railway (a subsidiary of the Canadian Northern Railway) arrived in North Red Deer from a junction further north with the intention of building a bridge across the Red Deer River as part of a new north-south railway line connecting Edmonton and Calgary. Unfortunately, a recession, financial troubles and the first world war delayed and ultimately nixed that plan. However, when Canadian National Railways absorbed the CNWR, a bridge was constructed over the river and the line extended south from the mouth of Waskasoo Creek to Ross Street (where the Co-op Shopping Centre now stands) where a small yard and temporary station was built. A new station was built in 1923 (at the current site of Alberts Restaurant) replacing the temporary station. It was a one-of-a-kind hybrid of a Canadian Northern third class station and a yet-to-be-standardized Canadian National Railways third class station. The station was 62'x24' with a platform 300'x12'. The main floor had a ticket office, waiting rooms, toilets, baggage and express. On the 2nd floor was a residence. After several washouts, the bridge across the river was abandoned in 1941. A new link had been made to the CPR yards further west where CNR trains shared trackage with CP to the north junction. The last passenger train left the station in 1955 at which time the ticket office and waiting rooms were replaced with more freight and express space. It was closed and demolished in 1960 when the yards were relocated back to the north side of river and the site redeveloped for the shopping centre. Photos at the time indicate a change of paint scheme in 1955 from white/grey with green trim to oxide red with cream trim.